We have achieved huge expertise in delivering the clients with the optimum quality Oil Free Dry Vacuum Pump. The Oil Free Dry Vacuum Pumps are fabricated with the premium quality components and parts and advanced machinery. The Oil Free Dry Vacuum Pumps find their application where oil contamination or oil fumes are undesirable. 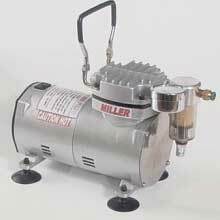 The Oil Free Dry Vacuum Pumps are available at the most reasonable rates in the market. Model F.A.D. LPM Vacuum Inch Hg. Rate Power Reqd. SSM-25CV 25 22 0.25 H.P. SSM-50CV 50 22 0.50 H.P. Model F.A.D. LPM Vacuum Inch Hg. Pressure PSI Power Reqd. SSV-75CV 75 28" 10 0.25 H.P. SSV-150CV 150 28" 10 0.50 H.P. SSV-300CV 300 27" 10 1.0 H.P. Model Flow Rate LPM Vacuum Hg Power Reqd. SSV-500CV 500 660 2 H.P. SSV-1000CV 1000 660 3 H.P.